On the 19th January IPMS Middleton Cheney sat down for its January club meeting, as well as the club’s annual AGM. Alongside the standard jokes, modelling and mucking about, we had the serious business of statements from each of the four committee members, elections for 2017, and questions and suggestions for the next twelve months. Chairman Martin set proceedings off with a heartfelt review of the club’s activities during 2016. We’re all incredibly proud of what we’ve achieved – the interest we received for the Star Trek display and the awards it won are testament to the efforts of a small club punching above its weight. Martin’s words were a reminder to all of us around the table that our achievements should be placed into the context of what IPMS Middleton Cheney is, and what we’ve done. It was a lovely way to start the AGM off and our 2016 performance leaves us in a great place for 2017. Gary provided a summary of the financial aspects of the club. Overall finances are strong with enough available now to facilitate expenditure on items for the club, more on which will be discussed later. Monthly subs continue to be sustainable enough to cover the cost of hiring the Parish Meeting Rooms. Overall therefore the club is in a strong position to invest for the upcoming year. Sam gave his views on 2016 and upcoming 2017 activities as club secretary. We reached an all-time high of model shows and events during 2016, and it’s intended that we scale this back somewhat for the year ahead. With the effort that Sam put into the Star Trek display, he will take a step back from the show circuit this year, attending some but not all of the shows we intend to cover. An initial calendar for the early part of 2017 was discussed between everyone, and a select number of shows agreed upon. Once these are confirmed we will announce them in due course. James detailed the club’s activity online over the past twelve months. The new website which was properly launched a year ago has given the club a much better presence online with greatly increased page views and the ability to share more photos and more news than ever before. In addition, the club’s Facebook presence has continued to grow steadily to more than 650 ‘likes’ at the time of the meeting. For the year ahead the target is to continue this growth and maintain the profile and appearance of the club online to attract new people into the hobby. All four committee members were re-elected to their positions for 2017 to the unanimous approval of everyone present. Following this, discussion turned to any other business. It was suggested that the club invest in a new banner for display at shows for clear identification. The point was made that although our Star Trek display became recognisable during 2016, the identity of the club to onlookers was likely to be a mystery to most. A clear logo and name on a banner, in the mould of most other clubs would rectify this matter and so a solution will be explored for use at our 2017 shows. Further to this, a suggestion was made to renew the club’s polo shirts, updating them in line with the club now carrying the IPMS moniker and this too will be explored alongside the banner with progress to be reported at the next club meeting in February. A request was put in by James to have access to a digital version of the club’s logo which is featured on the reverse of our current polo shirts. Having been originally hand-drawn by Martin, it’s believed that the only digital copy will be held by our printers and an action was taken to contact them and try and obtain a digital copy. This would allow the logo to be used across the website and Facebook and provide some more consistent branding for the club’s activities. A question was raised about the club’s participation with local scout groups this year. There are currently plans to visit two groups of scouts, one in Banbury and another in Brackley. This forms part of the club’s attempt to draw new young faces into the hobby of model-making and further details, including dates, will be confirmed in due course. With that, there were no further questions or suggestions and so matters turned to our latest works in progress and the 2016 trophy winners. More of that in the next post! Scale ModelWorld in Telford was the culmination of our year’s efforts, and it was a joy to join the many other clubs and SIGs, not just from Britain but across Europe in sharing in this fantastic hobby. Over the course of the two days we were inundated with people interested in the stand, with many stopping by to chat. 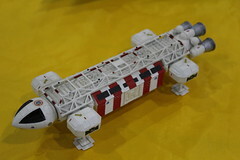 It was brilliant to see so many people take an interest in what we’ve produced and a sure sign that the sci-fi modelling category continues to go from strength to strength. 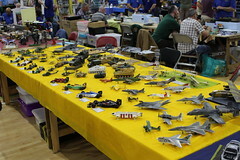 The show was made all the better by the sheer number and variety of clubs and SIGs displaying. 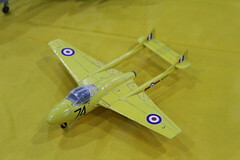 Club chairman Martin had two of his own models on display on the TV and Film SIG’s stand. We were very impressed by the standard and variety of work on show from everyone displaying. All deserve a huge pat on the back for producing such impressive work. A huge thank you must go out to the EC and everyone organising another great Telford show. To attend as a club displaying gives a different perspective rather than just as a normal visitor. You’re able to get a lot more out of the event. We wholeheartedly recommend other clubs to consider applying for a table next year, and now we need to go away and plan for ours! See you all next year! Here’s some modern armour to get excited about. Club member Craig has recently completed his latest model kit, the Revell 1/35 GTK Boxer sgSanKfz armoured ambulance, in German forces markings. The versatile German-Dutch Boxer comes in many variants. The Revell kit that Craig has built covers the medical ambulance module that is mounted on the vehicle, and comes with two variants of vehicles serving in Afghanistan in 2013. Craig will be entering the Boxer in the model club’s competition during the next round in October. It’s always great to see what each of us has come up with for our entries and the Boxer will no doubt scoop up some points when the votes are counted! Thanks Craig for sending the photos over! James’ latest F1 car has been a long time coming! It’s the Tamiya 1:20 Camel Team Lotus-Honda 99T. The kit itself is the original release from 1988 which is so old it contained the tobacco decals on the standard decal sheet! The standard kit has been modified with the addition of the Studio 27 photo-etch set, lots of carbon fibre decal sheet, wires, tubes and lots of other little extras, some scratch built. Seatbelts were added too. This car was driven by Ayrton Senna in 1987. This was the penultimate Formula 1 season for turbo cars, and the Lotus and its Honda engine was particularly suited to street circuits. Senna won two F1 races during the year, at Monaco and Detroit, and these would prove to be the final two races won by Team Lotus after a long and illustrious history in Formula 1. Senna would leave Lotus at the end of the year and join McLaren, beginning his famous rivalry with Alain Prost. Lotus would continue with Camel sponsorship until the end of 1990 as they gradually slipped down the order before pulling out of F1 completely at the end of 1994. With the additional detail added to the kit, the main body shell was left off and displayed on homemade paddock stands. As well as the photos here, check out the full set on Flickr, in lovely high resolution: https://www.flickr.com/photos/119092223@N07/? Right on the back of one show report comes another. On the 1st October we were at our 11th event of the year – Abingdon IPMS’ show at Larkmead School. This is an event that is more local to the club and consequently is a bit of an easier journey! Martin, Sam, James and Craig were present on the stand which was fully dedicated to our now regular Star Trek display. As well as a few pictures of the display, below you can check out some closer shots of some of the ships we had on display. All of the small ships have been built by Sam, and they make up quite a sizeable fleet now! All of these smaller craft are the same scale, giving an idea of the relative sizes of the different ships in the Star Trek universe. We had a great time at the show and we managed to pick up a few new additions to our stashes as well – more sci-fi goodness for Sam and Martin, while James picked up the newly re-released Italeri Manx Norton. Some work in progress shots of these new purchases might make their way onto these pages, you never know…! Getting bored of our Star Trek display yet? Well, there’s just one event left on our calendar for 2016 – the big one! See you all at Telford for Scale ModelWorld in November! It’s been a bit quiet lately on the website, but here’s a treat for you. Sam and Matt travelled up to the Sutton Coldfield Model Spectacular on 11th September and with them came our Star Trek display as we made our debut at our most northerly show in the club’s history! Both had a great time at a new show, and Matt got all technological and live-streamed a video of our display during the show on Facebook! We saved the video and now you can enjoy it too whenever you want. Check out the video on our Facebook page, and while you’re there, give us a ‘like’ if you haven’t done so already! Thanks to Sutton Coldfield Model Makers Society for having us along and putting on a great show. We love to be able to do new events – its all about seeing new clubs, new displays and new people. It’s easy to allow the show circuit to get stagnated so freshening it up with some new appearances always gets the creative juices flowing once more! P.S. Those readers who are IPMS members may have noticed an article featuring our Star Trek display in the latest issue of the magazine in September – we’re finally famous! Our thanks goes to the magazine’s editor Don for kindly publishing the article for us, and if you still haven’t seen the display in person for yourself, remember we’ll be at IPMS Abingdon’s show on the 1st October, and also the ‘big one’ – Scale ModelWorld in Telford in November, so catch us while you can!